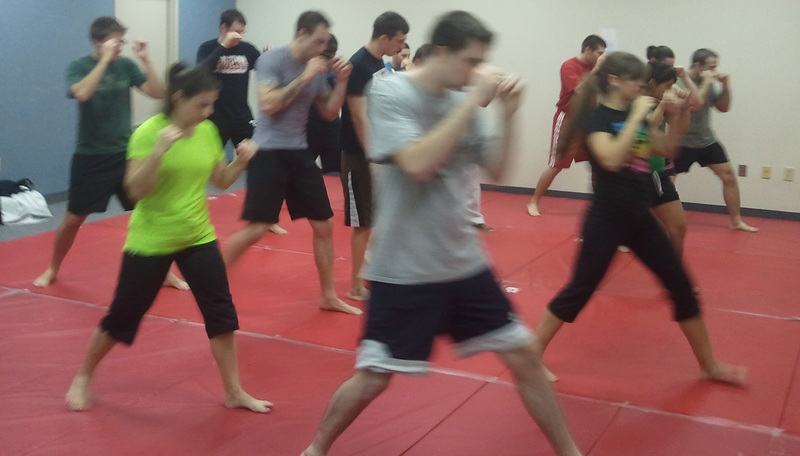 8 Week Kickboxing Fundamentals Program – Only $49! This 8 week program will cover the basics of Muay Thai Kickboxing! Imagine being in a fight and having twice as many options to attack as your opponent. Now imagine having four times as many. Muay Thai is often called “The Art of 8 Limbs.” Practitioners of Muay Thai Kickboxing use punches, kicks, knees, and elbows to inflict damage. Even better, Muay Thai utilizes the clinch, a close-range tool by which you can deliver devastating strikes to end any fight, or throw your opponent to the ground. Classes will meet at 6:30 PM on Mondays and Wednesdays. The lesson on Monday will be repeated on Wednesday, so if you can make it to both days, you’ll be able to get a second look at the same basic lesson, and if you can’t make it one day or the other, you wont’ be behind for the next week! Lessons begin November 2nd. Best of all- you don’t need any equipment to get started! If you don’t have gloves, you can use our “loaner” equipment. This class is only $49. Call 804-657-7461 to reserve your spot, or come try a free introductory Muay Thai class before the program begins. You can also visit our Muay Thai information site for more info about our program. Come to the end of the parking lot. We’re in the building at the end for this week and next week!